Details of a wedding are very important to set the tone of the big day! 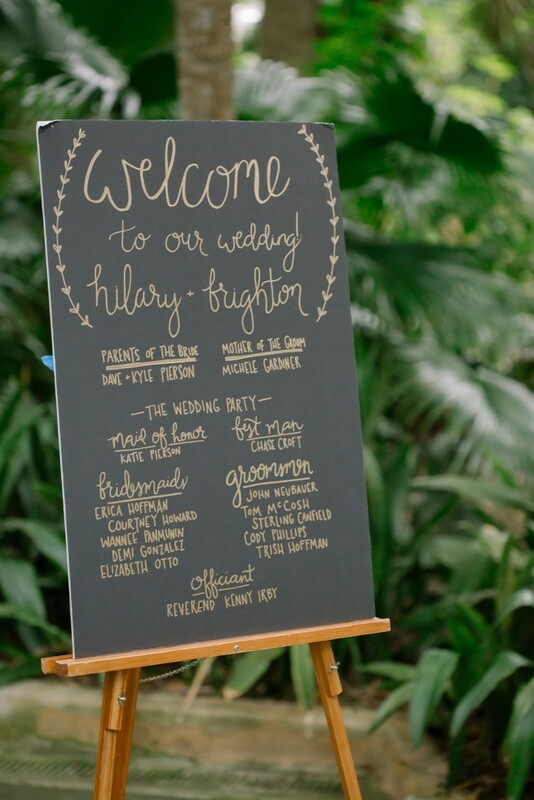 We wanted our garden wedding to be casual, yet fun and relaxed with rustic tendencies. Since we chose to have the wedding in Florida, and I couldn’t have mountains as my backdrop, I desperately wanted something “nature-ish” as our venue. 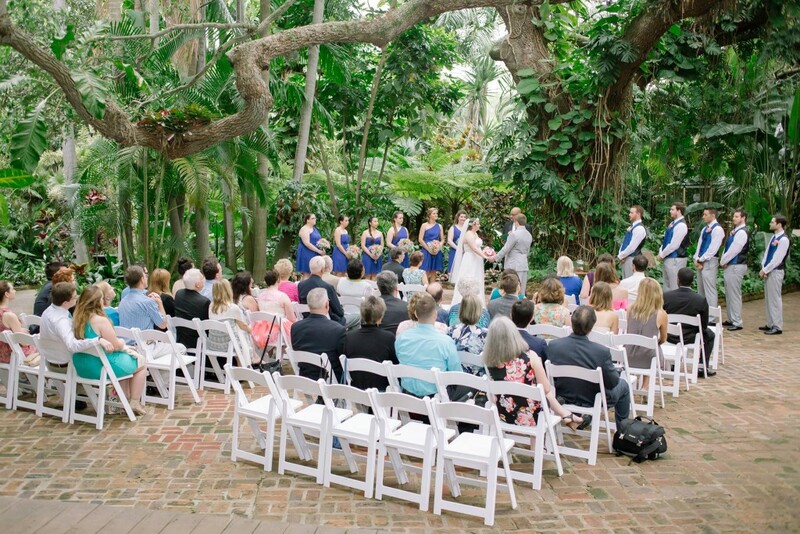 I also know that weather in Florida is very unpredictable so I wanted an indoor reception location, that could also double as our ceremony back-up plan in case of rain. We decided on a botanical garden located in St. Pete. I loved this decision. It was gorgeous, and easy to decorate. It also rained. Lovely. The moral of the story is that having an indoor/outdoor venue was easy to make beautiful with minimal decor and headache. 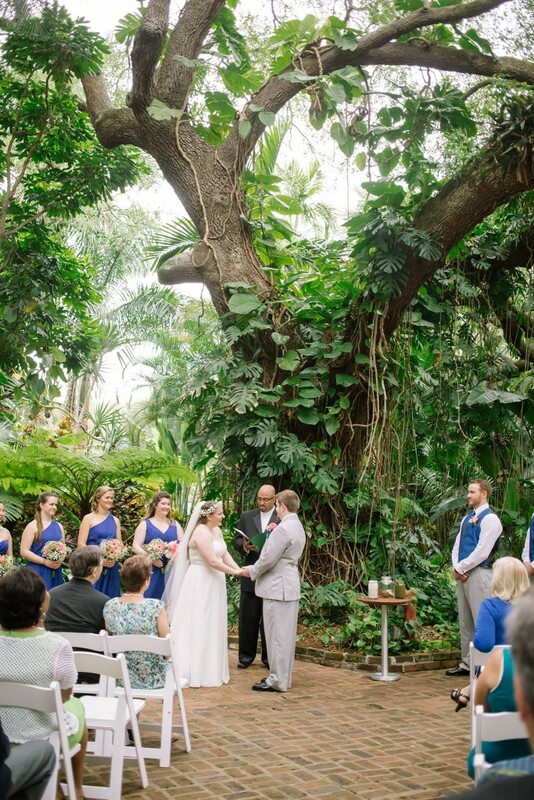 Since our wedding was at a botanical gardens, not much decoration was necessary. Just the way I like it– Let nature do the decorating! We had our wedding ceremony under a huge 250 year old oak tree with a brick patio. We had an additional table for our sand ceremony (more on that in a later post), and the white chairs. 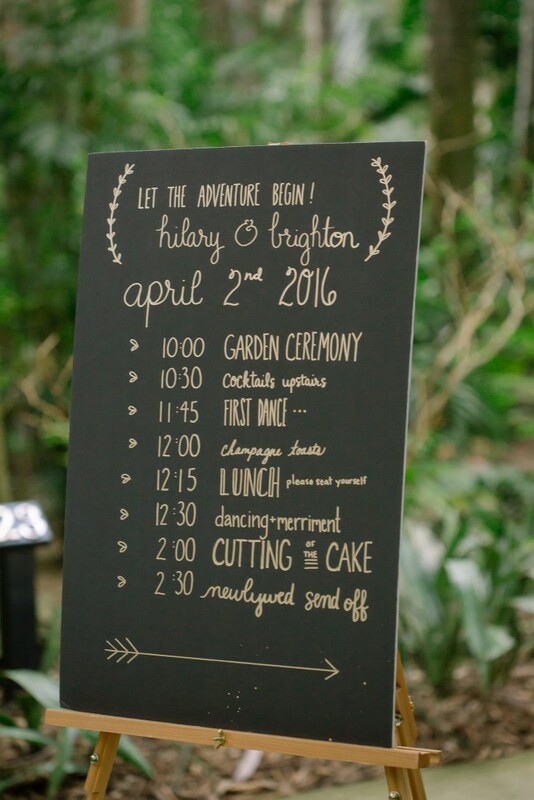 We only really had a need for a couple signs as a program for our ceremony and welcoming the guests. Instead of a program, we chose to list the schedule of events on a black foam core board ($1 from the Dollar Tree!!!) with my bridesmaid, Courtney’s beautiful handwriting. I found Pinspiration online about what I wanted it to say and how I wanted it to look, and she wrote it in gold paint pen. I chose not to waste paper, and no one seemed to miss the individual paper programs. Win/win! We also had the wedding party, parents of the bride and groom, and our officiant listed for everyone as well for their recognition. We were able to borrow the easels from our wedding venue and save money! I will admit it. My choice of flowers was not carefully thought out and pinned. I had a general idea of what I wanted, and I know about 4 species of flowers that I like. I sent photos of the flower arrangements to my florist via my parents, and I ended up changing almost everything 8 days before the wedding. I think I was happier for it. I wanted to keep the bridesmaids’ bouquets simple and affordable. 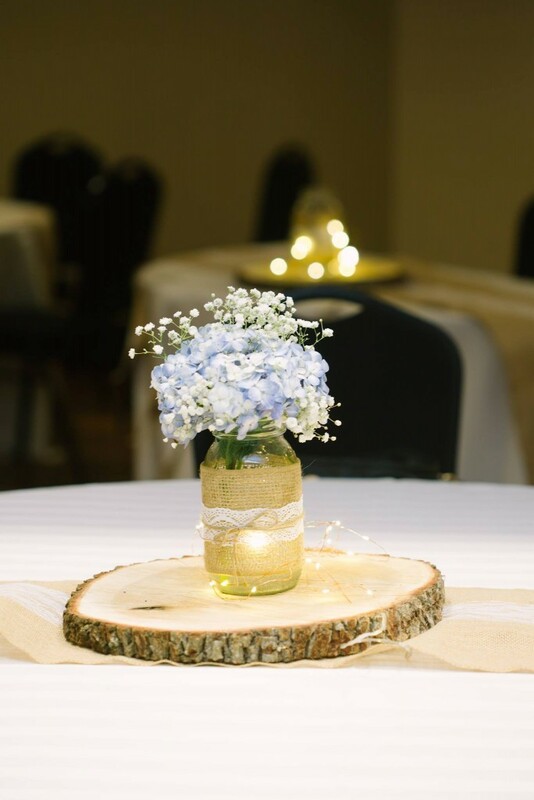 I really wanted them to hold more than one flower (I had seen that on Pinterest and hated the idea), and I wanted it to be a little more than just baby’s breath. 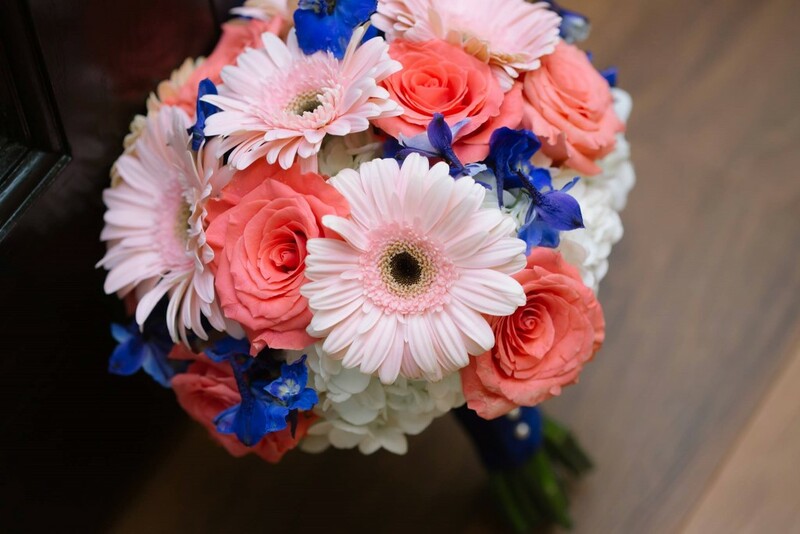 I decided on pink gerber daisies, babys breath, and a lime green accent flower bupleurum. I think they turned out pretty nice. I almost wished that they were a little bigger, but overall I was happy with the turnout. 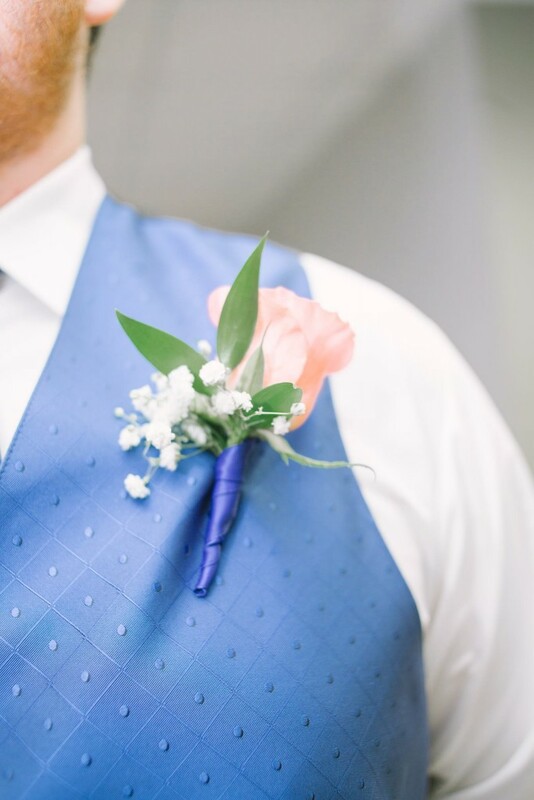 For the men’s boutonnieres, I chose to keep it in line with what I had in my bouquet with the coral roses with a little baby’s breath, tied with cobalt blue ribbon. 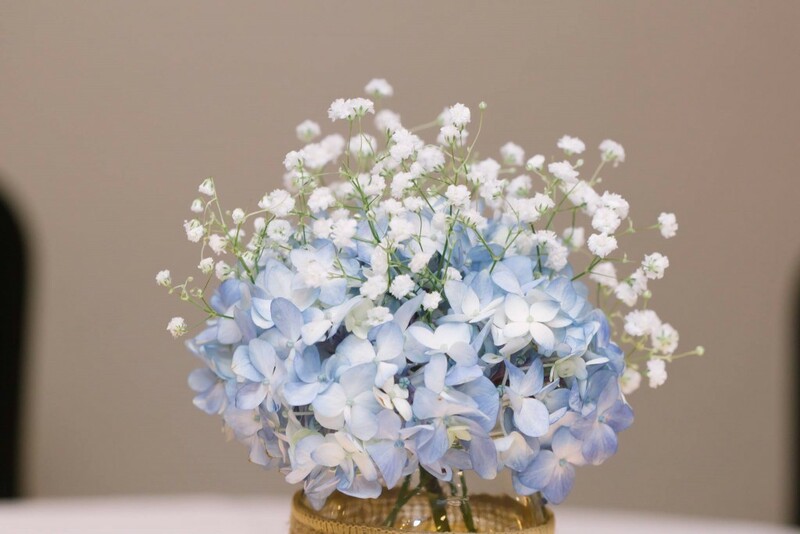 I kept with the baby’s breath and hydrangea theme with the centerpieces. (I will discuss the centerpiece as a whole later in this post.) I liked that they were simple but elegant. 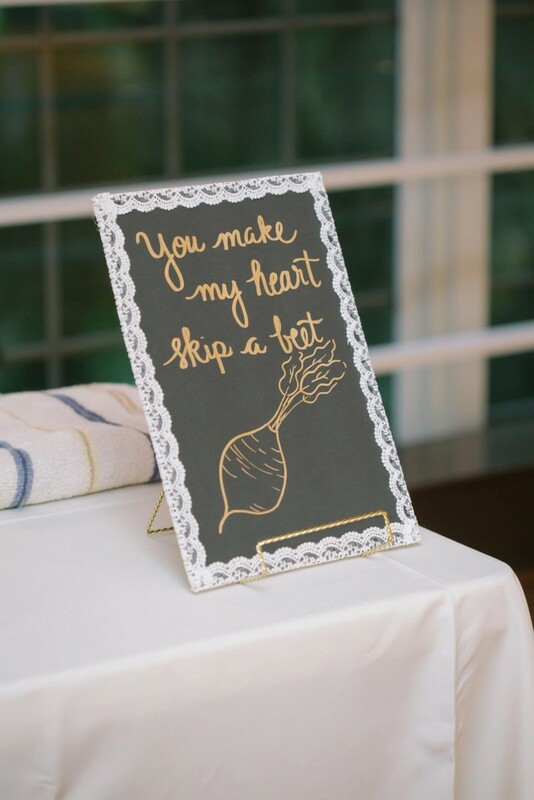 When I first started planning, after we’d chosen a venue, I immediately knew that I wanted to do something with a garden pun theme. After all, we were becoming the Gardiners, getting married in a garden! I came up with all sorts of puns, and I wanted to display them somehow. They became my additional signs and decor. 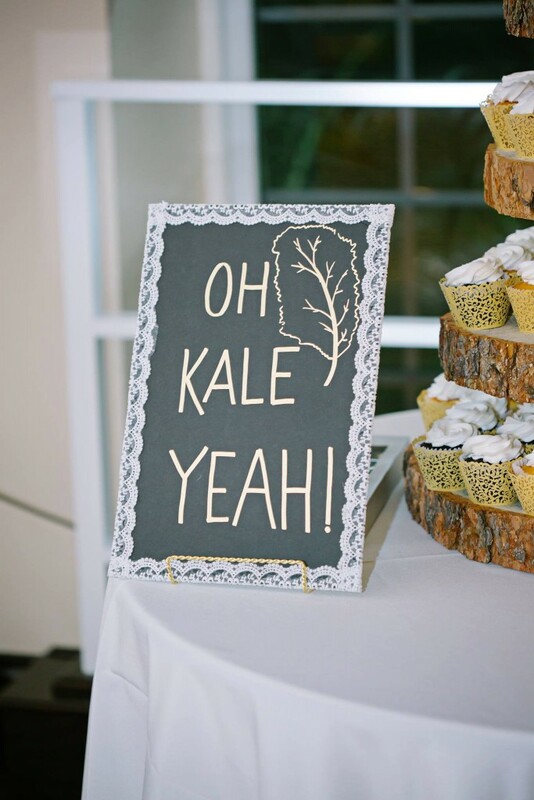 To make the signs, we bought black foam core from the Dollar Tree ($1 per board versus $3-6 at Michael’s, woop woop!) and gold photo stand/holders. We also bought gold paint pens and a couple spools of lace. 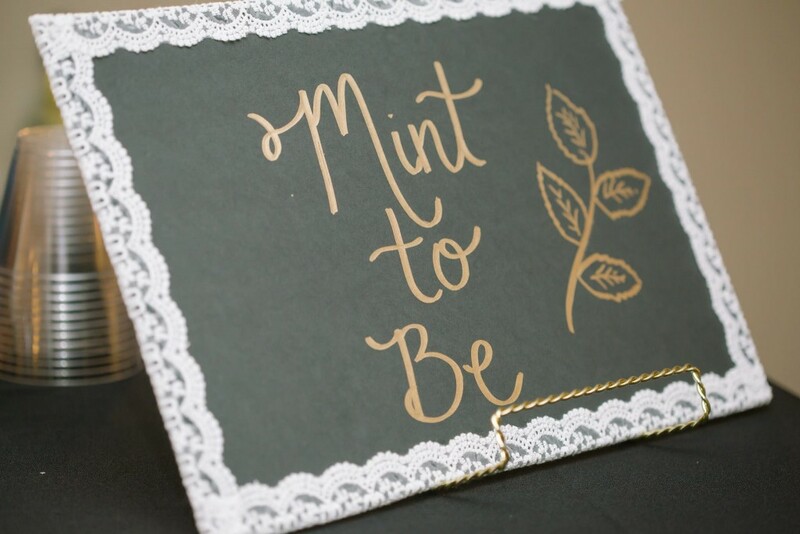 We simply glued the lace all around the edges of the the sign, and voila! A beautiful sign for cheap. Aren’t they awesome?! Easy, cheap, and fun! 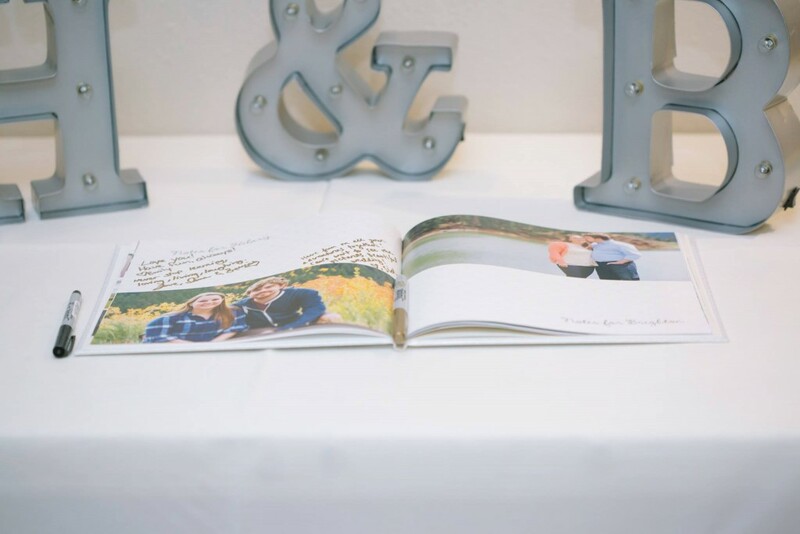 I contemplated having a few different ideas for our guestbook, but I ended up going simple on Shutterfly. Brighton and I have literally thousands of photos together, and I combined photos from the two engagement shoots we had, plus photos from our adventures together into a photobook that I made on Shutterfly. 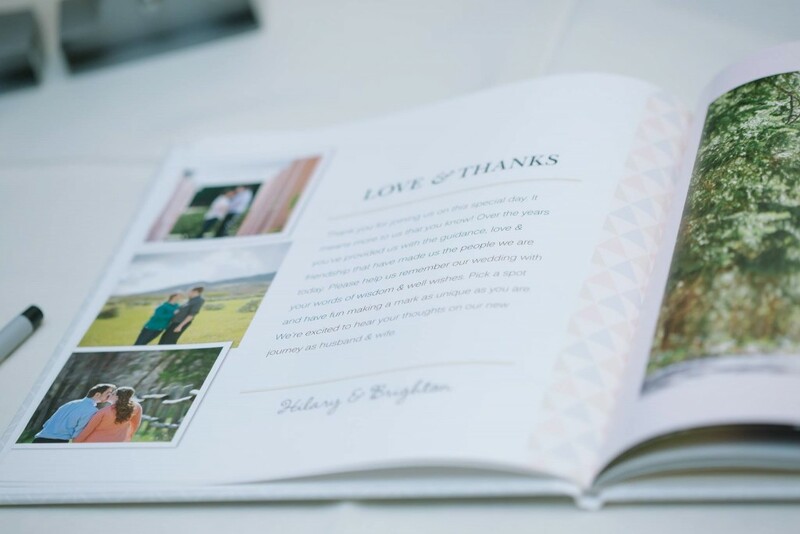 They have pre-made templates specifically for wedding guestbooks that was super easy to use. You just upload, select, and go! I would say that centerpieces and linens were very low on my priority list when planning my wedding. I didn’t know, and I got to the point where I didn’t really care as long as it was done. Luckily, I am quick at making decisions and getting things done, so it turned out beautifully! First, I rented linens from a local event rental company, Rent-All City. I stayed simple with ivory linens since it would pretty much match anything I chose for my centerpiece or runners. 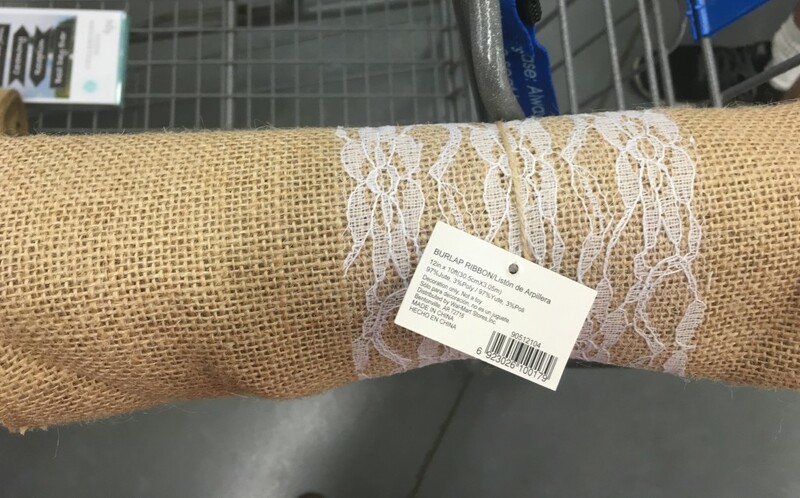 I went with burlap and lace runners that I found at Walmart the week before the wedding. I originally had “coral” runners from Amazon, but ended up being extremely poor quality, and not exactly “coral” either. They saved me a lot of headache and time, and they were exactly what I wanted! 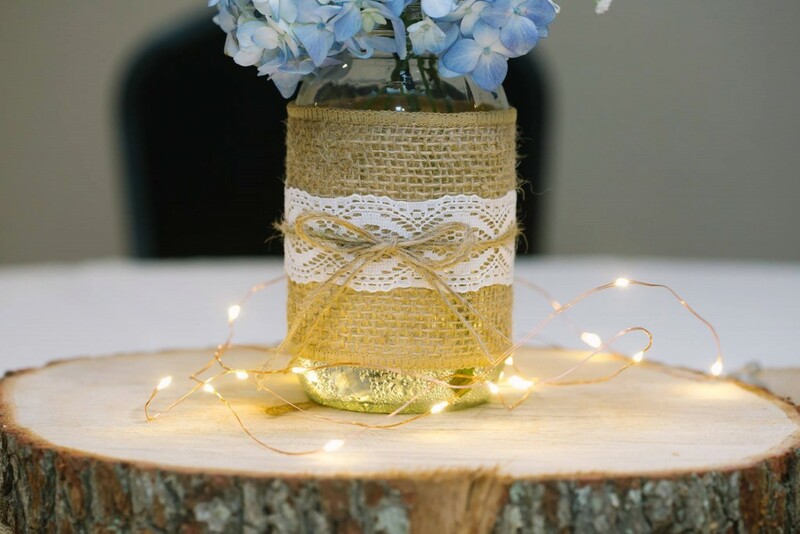 We bought mason jars, spools of ribbon, and burlap for the centerpieces. Michael’s has lots of pre-made mason jars with burlap and ribbon, but we ended up saving a lot of money making them ourselves. It wasn’t even that time consuming. 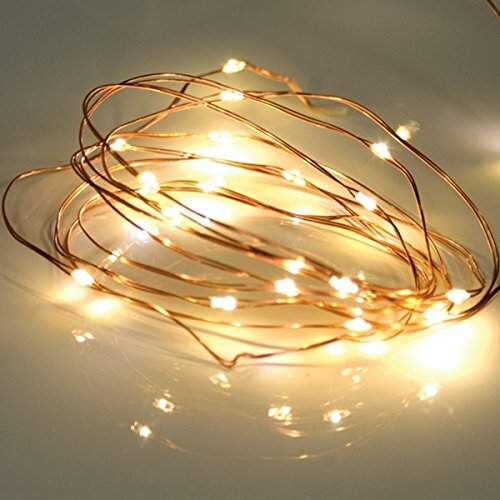 Instead of candles, we went with battery operated string lights from Amazon. Look at how adorable these are! 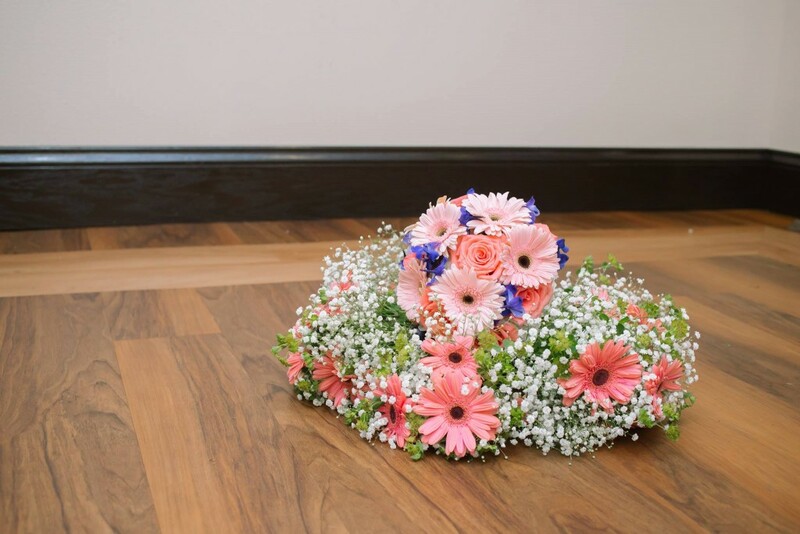 They were inexpensive, long lasting, and gave the perfect vibe we were looking for in our reception hall. The last detail was the wood cross-sections. I wanted to match the rustic/garden wedding theme, but I didn’t want to spend a fortune. Michael’s was selling the tree cross-sections for $10… per piece!! I had 11 tables, and I didn’t want to spend $100 just on wood cuts. I called a local plant nursery to see if they had any for cheaper or free, and they didn’t. Luckily, they did know a couple landscaping companies that did. I called, explained what I needed, and he knew exactly what I wanted. And, he gave it to us for free since it was for our wedding! Kevin was so sweet, and super accommodating on short notice. 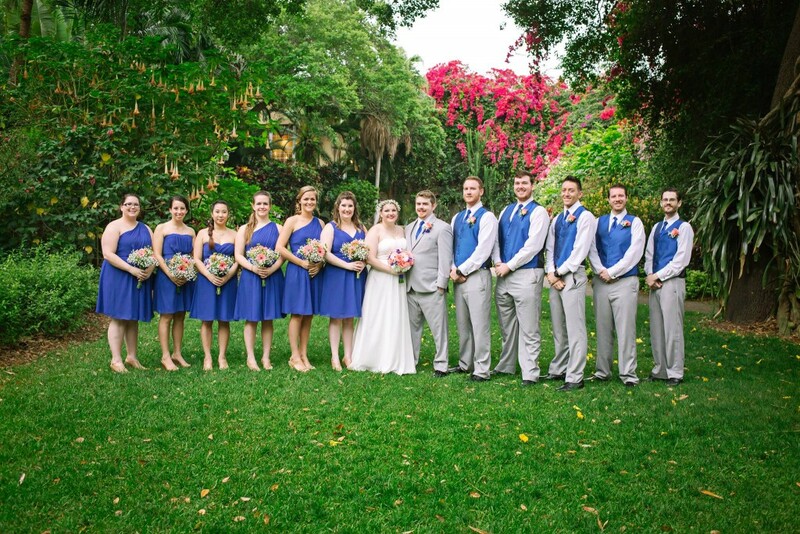 (This was 4 days before the wedding…) If you’re in the Tampa Bay area, and need any tree work done, I highly suggest Kevin for his awesome customer service! Wedding cake tasting is always portrayed as this fun activity for couples in movies. I did not have the luxury of living in the location for my wedding, so I missed out on the fun. The great part of this was that I already knew what cake I wanted for my wedding. (Sorry, Brighton!) Publix is my favorite bakery/grocery store back home, and I also love cupcakes (especially theirs). No cake tasting necessary! Since I knew we’d want something to cut, I decided to get the smallest possible cake on the top for that purpose. 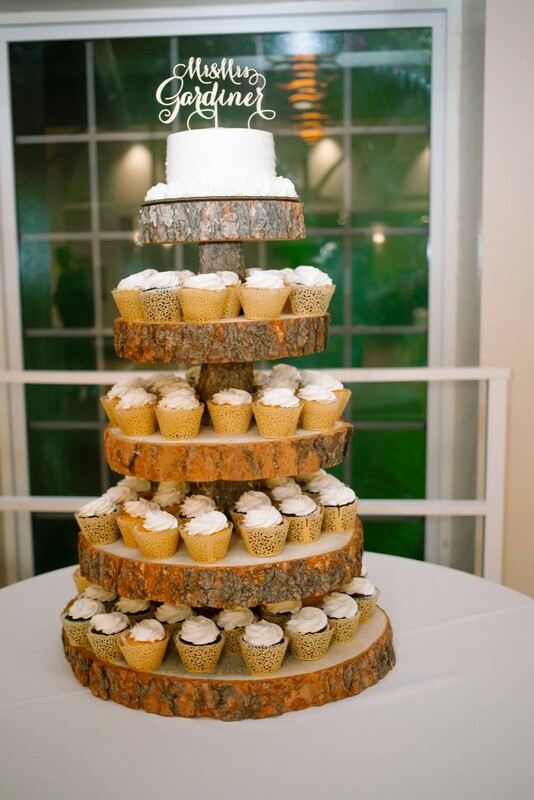 I knew I wanted a cupcake cake, with a wood cake stand. When I first told this to my mom, she seemed pretty skeptical. 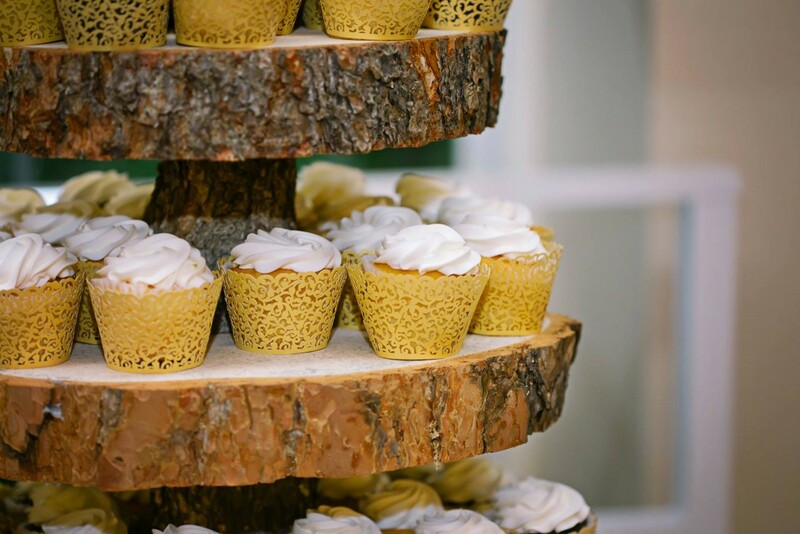 She said, “You want a tree as your wedding cake stand?…” and I remember saying, “Yes, exactly! Look at this Pin! !” and I showed her. I contacted an Etsy seller, Postscripts, to custom make it for my number of cupcakes (90), and the final product was shipped to me… All 58 pounds of it! It was absolutely perfect and everything I wanted it to be. 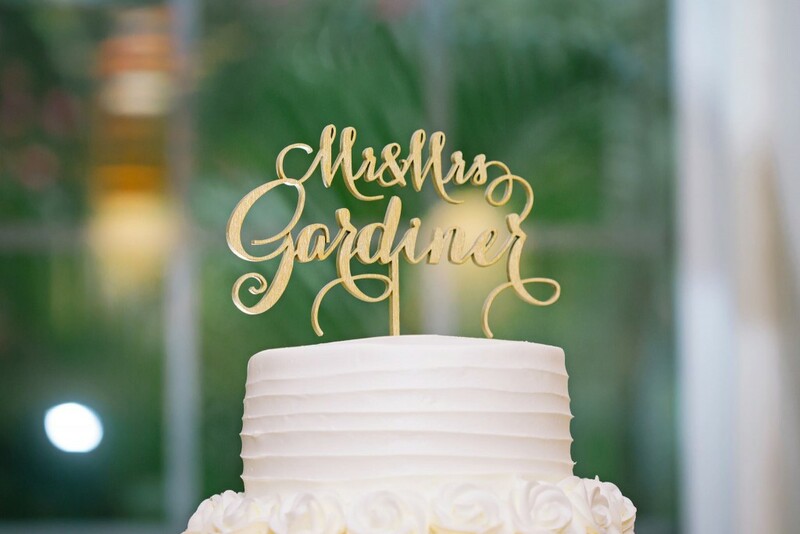 Finally, I bought a gold personalized cake topper with our new last name off Etsy. The cake was exactly as I had imagined. I was extremely happy with all of my Etsy vendors, Publix, and Amazon for this little creation. 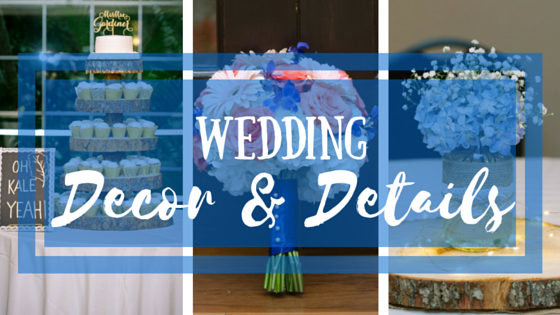 There you have it– Our wedding decor and details! As you may recall, this was one of the last parts to nail down. I had general ideas, but I didn’t pre-make many of these details due to the distance of the wedding. I figured that I could pull it off the week before the wedding, and I did (with little help from my friends, of course!) In fact, the majority of it was done in 1 day! What did you/do you want to spend time preparing for your wedding decor? Did you have any DIY wins or fails? Tell me about them!